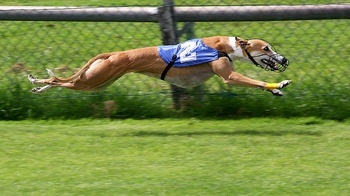 With incredible sprinting speeds, strength and acceleration, greyhounds can chase down just about anything that runs. Throughout history they’ve been used to hunt a wide variety of game, from deer, foxes, rabbits and hares to antelope, gazelles and wolves. In America today, they’re still used for small-game hunting of rabbits, as well as coyote hunting. They are sighthounds, which means that they spot and then give chase to game rather than using their nose to scent-trail and corner game. Anything running is likely to elicit a high-prey-drive dog’s chase response – which is what makes them so popular in the racing and luring worlds, but presents special challenges for pet owners. In the controlled environment of the racing world, a dog giving chase isn’t in danger, but in an uncontrolled environment like a park or the countryside, a greyhound that spots something to pursue (rabbits, deer or even cats) can be off like lightning and out of your sight in seconds. This poses a danger to the dog – from becoming lost to being hit by a car – and pet owners should take proper precautions by always keeping the dog leashed or otherwise under control. Despite its royal background and propensity to chase, greyhounds make excellent pets. Contrary to its athletic build and countryside-gobbling stride, the greyhound does not require huge amounts of exercise. They’re often referred to as “45-mile-per-hour couch potatoes” because of their laid back dispositions and inclination to sleep much of the day. They are sprinters (possessing the highest percentage of fast-twitch muscles of any breed) and not marathon runners; short bursts of exercise suits them more than a long, enduring run. They’re also quiet dogs that don’t tend to bark. Retired racing hounds are also fairly comfortable in crates, so using one in the home is a great way to make the dog feel comfortable and give him his own spot in the house. These traits, along with being loyal and loving, make them surprisingly adaptable to apartment life, and could be easier to keep than a small dog that alert-barks at every passing step or another breed of hunting dog that does require large amounts of exercise. Additionally, the greyhound’s short, thin coat requires minimal care and won’t shed as much as other breeds – another bonus for homeowners and apartment dwellers! That short coat can come in many colors and is “immaterial” for show dogs; some common colors include brindle, fawn, red, black, white and combinations of those and other colors. It should be short, smooth and firm of texture. Above all else, greyhounds are athletes – the world-record Olympic sprinters of the canine world. They have large hearts that pump higher-than-normal levels of oxygen-rich red blood cells to well-muscled shoulders and haunches. Greyhounds should stand 27 to 30 inches tall at the shoulder and weigh 60 to 88 pounds (females tend to be smaller, of course). They are fairly long-lived dogs, with an average lifespan of 10 to 13 years. As deep-chested dogs, they are susceptible to gastric torsion (commonly referred to as bloat). Esophageal achalasia and osteosarcoma, or bone cancer, can also be of concern. There are also a couple of genetic mutations that afflict greyhounds. At Paw Print Genetics, we can panel-screen greyhounds for three known mutations, including the two neurological, and life-threatening, disorders of degenerative myelopathy and the greyhound-specific polyneuropathy. Polyneuropathy is an inherited neurologic disorder that leads to nerve degeneration in Greyhounds. Affected dogs typically present between two and six months of age with uncoordinated movements and inability to exercise as much as their littermates. However, some dogs may not present until adulthood. Symptoms typically progress over time but some dogs may seem to have episodes of recovery. Affected dogs develop difficulties eating and may cough or gag while trying to swallow. Other features of the disease including muscle wasting and reduced reflexes and many affected dogs need to be euthanized. For those interested in breeding for or away from the dilute gene, or diagnosing possible alopecia-related issues, Paw Print Genetics can also test for the dilute (D-locus) coat color.